크리스마스 즈음에(on the occasion of Christmas) 가장 사랑받는 노래가 '징글 벨(Jingle Bells)'이다. '징글'은 '딸랑'이라는 뜻이다. 이 노래가 원래는 인종차별적 뿌리를 갖고 있다는(have racist roots) 학설이 제기됐다. 미국 보스턴대의 카이아나 해밀 교수가 매사추세츠주(州) 메드퍼드와 조지아주 사바나가 서로 이 상징적 노래의 탄생지라고 주장하는(claim to be the birthplace of the iconic tune) 논란을 매듭짓기 위해(in order to settle the dispute) 역사를 더듬어가다가(trace its history) 그런 역사적 사실을 발견했다고(uncover the historical fact) 한다. 해밀 교수에 따르면 이 노래는 1857년 보스턴 시내에서 'One Horse Open Sleigh(말 한 필이 끄는 지붕 없는 썰매)'라는 곡명으로 처음 공연됐으며, 백인들이 불에 탄 코르크로 얼굴을 검게 칠하고(blacken up with burnt cork on their faces) 흑인들을 조롱하며(make fun of African-Americans) 이 노래를 불렀다. 흑인 분장을 한 백인들의 쇼(a minstrel show)였다. 이런 공연은 1930년대까지 계속됐다. 매사추세츠주에선 '징글벨'이 1850년 메드퍼드의 한 선술집에서 처음 만들어졌다고 주장하지만 사실이 아니라고 해밀 교수는 말한다. 1857년 조지아주 사바나의 한 교회 오르간 주자였던 제임스 피어폰트가 작곡한 것이 맞는다고 한다. 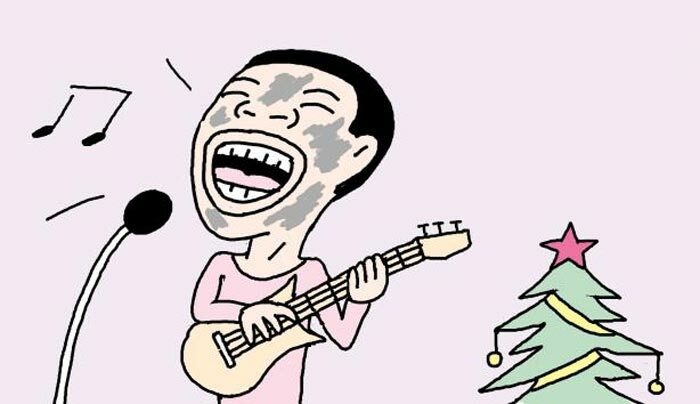 그리고 같은 해 흑인 분장 쇼에서 처음 공연됐다는(be first performed in blackface) 것이다. 해밀 교수의 연구논문(research paper)은 일각의 격앙된 반응을 일으키기도(attract furious reaction) 했다. "악의 없고 무해한 것으로 여겨져 온(be considered innocuous and inoffensive) 신성한 캐럴에 왜 느닷없이 인종주의 운운하며 난도질을 하느냐(cut it to ribbons)"는 반발이었다. "교수랍시고 빈둥거리며 역사 일부를 끄집어내 모두 인종차별적이라고 주절대는 것 외엔(besides sit around and pick a part of our history and call everything racist) 할 일이 없느냐"는 비아냥도 들었다. 뜻하지 않은 풍파를 일으키자(make unintentional waves) 해밀 교수는 세계적으로 유명한 캐럴(world-famous carol)에 찬물을 끼얹으려는(hit a sour note) 의도는 없다고 해명했다. 다만 인종주의적 기원(racist origins)을 밝혀 흑백 구성에 미친 문제적 역할에 대해 성찰해보자는(reflect on its problematic role in the construction of blackness and whiteness) 뜻이었을 뿐이라고 했다. "사람들을 화나게 하거나(make people upset) 짜증 나게 하려는(rile them up) 것이 아니다. 징글벨을 부르지 말자는 것도 아니다. 그런데 왜 내 연구 결과를 매도하고(denounce my findings) 침소봉대하는지(blow it out of proportion) 알 수 없다"며 우울한 연말을 보내고 있다 한다.